FoodForward SA was thrilled to receive word from Susan Wright, founder of bonhappi-T, that we would be receiving a whopping R350,000 donation as a result of a successful partnership between bonhappi-T and Pick n Pay last year. Bonhappi-T is a social entrepreneurship company with a global online store – bonhappi-t.com – operating since August 2016. Every bonhappi-T shirt purchased “feeds a mouth for a month,” in the sense that they donate R25 to FoodForward SA for each product sold. 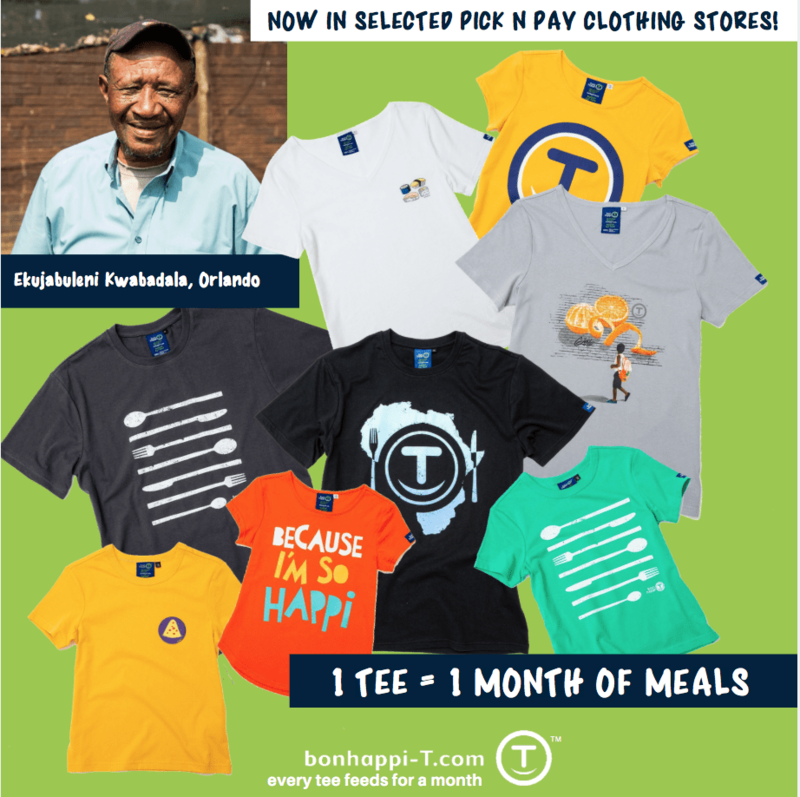 Late in 2018 bonhappi-T partnered with Pick n Pay Clothing to sell their shirts in select stores nationally. Through the partnership, bonhappi-T was able to significantly increase the number of shirts sold, and in turn, their donations to FFSA. We sat down with Susan to reflect on the relationship between FoodForward SA and bonhappi-T and hear some of her insights into her business journey. FFSA: Let’s start at the beginning, as they say. When did bonhappi-T come into being, and importantly – why? FFSA: How did the relationship with FoodForward SA come about? SW: In 2015 I was putting together the strategy for bonhappi-T and researching on the internet how we could feed someone for a month – it had to be something sustainable, so feeding for a day or a week wasn’t an option. I came across FoodForward SA (which was known as FoodBank in those days), looked through 2 years of annual reports, and made contact with the head office in Cape Town. Felix and I met with the team, liked what we found and immediately knew that we wanted a partnership with the organisation. We reached an agreement that FoodForward SA would give us exclusivity on the provision of casual wear to feed people for a month through their foodbanking program, and it’s been an excellent relationship ever since. FFSA: How does your business model work? SW: Bonhappi-T is a for-profit enterprise that donates part of its revenue to beneficiary NPOs that provide food to those who need it. FoodForward SA is our people-feeding NPO. Feeding is a cost for bonhappi-T that is included in the price of the product on sale. 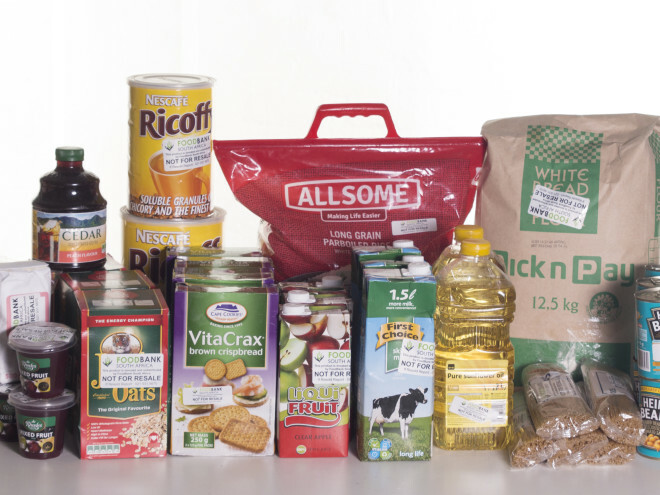 On receipt of payment from the customer, we transfer a feeding cost (R25 per shirt) for a month of meals, as a donation, on behalf of the customer, to FoodForwardSA and receive a Section 18 A tax certificate for those donations every year. We use the products we sell to help build the bridge between those who want to do good and vulnerable people that need food. 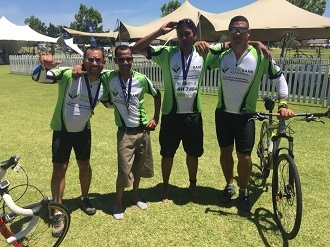 FFSA: In 2019 we saw quite a significant spike in the amount of money that bonhappi-T donated to FoodForward SA as a result of the t-shirts going on sale at selected Pick n Pay clothing stores over the festive period. Can you tell us more about that partnership – how did it come about and what did it achieve? SW: I approached Pick n Pay to pitch a partnership to them. I met with Suzanne Ackerman-Berman (Pick n Pay Director of Transformation), Andre Nel (Sustainability Manager), and Megan Potgieter (Clothing Manager) and was delighted that they agreed to distribute the shirts at a reduced price (only R129 or R159) at various Pick n Pay clothing stores across the country. As a result we sold 14,031 bonhappi-Ts incorporating men, women, boys, girls, and we could then donate R350,775 to FoodForward SA. FFSA: Would you say yours is a replicable model for social entrepreneurs? SW: Absolutely! But I have to say that although it is do-able, none of this has happened overnight. It took us about a year just to set up the business – building it up from the bottom with a very specific selling price as the goal, creating quality partnerships and constantly looking for new ways to sell a quality, fashionable product that connects people who can with people who can’t. We are just making it easy for shoppers to help others at no extra cost or effort. People buy t-shirts anyway so all we are doing is switching them to a socially conscious brand. We are very careful to ensure that we offer a quality, fashionable product that is competitively priced at just under R300 (online with free shipping) and R129 and R159 at Pick n Pay while stocks last. We are making it easy to do good with the end goal of making it part of everyday life – which it should be! Since the partnership started in August 2016, bonhappi-T has donated R530,914 to FoodForward SA through the support of the people who purchase their t-shirts – known as the #bonhappiTRIBE. This has facilitated redistribution of 661,941 meals! A huge and heartfelt thank you to all of you – this is a perfect example of how by working together, we can make a difference.